On a perfect night the Ebor Players renewed annual rivalry with a new look Parish Council Village Select XI in the annual cricket match. As usual the Players won the toss and put the Council into bat (6 of the previous 7 encounters have been won by the team batting second). Captain Godfrey strode magnificently to the crease and 3 minutes later was heading in the opposite direction cruelly given lbw to the lucky bowling of opposite number Tom Davis, clearly sacrificing his wicket to allow lesser mortals a chance. His courage was rewarded as first Mike Dale and then Ben Jemison made quick-fire runs to retire unbeaten on 13 and 10 respectively. Meanwhile fellow opener Jo Bewley continued doggedly in pursuit of runs, she was joined at the crease by record run scorer Stewart Harrison who added to his total before being caught and bowled by Dunn. Cath Bruce was next up and she added her customary energy to proceedings never taking no for an answer in pursuit of the quick single. Bewley had now departed the scene being caught by newcomer Schofield off the bowling of Curran and the Players were making a fight of it. Chris Gajewicz complete with runner Nick Smith, unable to bat due to a poorly finger made only 1 before hitting her wicket, the distraction of Smiths running clearly got to her. Her replacement was Carole Green making a welcome return after a number of years absence and following a career best 3 she was retired by captain Godfrey. However this proved to be a gamble as a flurry of wickets followed as Bruce was caught Dunn off the bowling of Davis for 5 soon to be followed by debutant Steve Pallender who despite making a promising opening boundary fell next ball to Linfoot. Next up and soon to be out was Lisa Thornton who proved that darts really is the only sport she is good at, out for 0 again. This left newcomer Jacob Green like Cinders (coincidentally this year’s Panto) with no-one to go to the ball with, unbeaten on 4. The Council team finishing on a respectable 92 all out. In reply the Players started well with openers batting in contrasting fashion – Alex Schofield looking confident fending off all that the opposition could throw at him whilst Matt Taylor looked more Boycottesque. 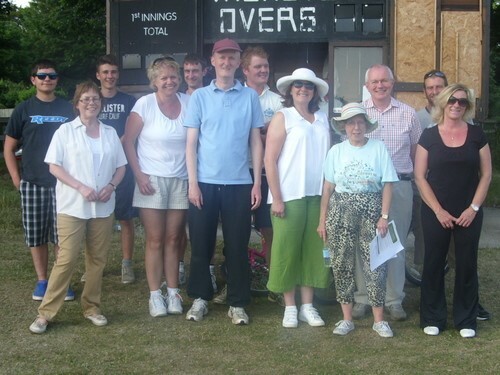 However on the departure of Schofield for an unbeaten 10, next batsman, Diane Curran was shortly to follow him to the pavilion without troubling the scorers. Enter captain Davis who attempted to move the scoring along but despite a gallant career best 7 he was brilliantly caught by opposite number Godfrey off the bowling of Pallender. Meanwhile Taylor plodded along with productivity reminiscent of a French tyre plant worker. Julia Sykes now entered the fray and put up dogged resistance but added just 2 (the same number of lines that she usually gets in Panto) to the score before departing following a catch by Pallender off the bowling of Jacob Green. However the run rate for the Players was becoming critical and once Alistair Dunn had been bowled by Dale for a gallant 9 all hope seemed lost. Taylor followed shortly after for a grand score of 5. Unfortunately for the Players this tail did not wag. Despite dogged resistance from Steve Poulter 7 not out, tight bowling, good fielding most notably from Thornton who adopted the famous words issued at the Battle of Verdun in 1916 ‘Ils ne passeront pas’ the Players regularly lost wickets, in particular to the demon bowling of Harrison who finished with 3 victims. A big thanks must go to all who helped make this a successful evening.